Today on Meet the Press, a major Republican figure, former Secretary of State, Colin Powell endorsed Senator Barack Obama for president. Colin Powell had a lot of positive things to say about Senator McCain, but despite the positivity, he decided instead to break with party lines and endorse Senator Obama for the presidency of the United States. I have never heard a major American figure describe Senator Obama as eloquently as Mr. Powell. It was breathtakingly broad, and this endorsement sends a message of solidarity, and is a major political statement. The selection of Sarah Palin as Senator McCain’s running mate had a lot to do with his decision. It shows McCain’s lack of judgment in choosing someone with so little political experience on the national level, and frankly, not ready to be the president of the United States of America. Senator McCain’s endorsements by four former Secretaries of State and 200 hundred generals are grand, but Powell’s surprising endorsement of Obama is a major blow for McCain. I really think that he is standing up to the disgusting rhetoric and tactics of the McCain-Palin campaign. What troubled Mr. Powell most is what members of his party are saying, and are permitted to say. “Do you know that Mr. Obama is a Muslim? So what if he’s a Muslim, is something wrong with that?” Mr. Powell said that this is not the way we should be thinking in this country. His decision is also based on Obama’s ability to inspire, the inclusive nature of his campaign, his intellectual vigor, and his beliefs that all Americans have value. 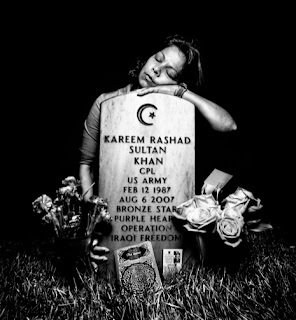 This is a photo of Kareem Rasdad Sultan Khan's mother weeping at his son’s grave side in Arlington National Cemetery that so moved Colin Powell. Kareem is a Muslim and was just 14 years old at the time of the 9/11 attacks on America. He died for this country fighting in Iraq at only twenty years old. He wanted to serve his country and ending up giving his life for it. He is an American. This is his country too!